"Hi, I have been following the M:MK Coaching page for a while now from a distance, & am really inspired by the delicate way you manage to encourage us all. How do I go about speaking with you, to see if you can guide me in turning the weeds in my life, into wishes again?" So I offered her a complimentary phone call, & it was clear after a few minutes talking on the phone, I was the right Coach for her, & she was the right client for me, we just clicked. 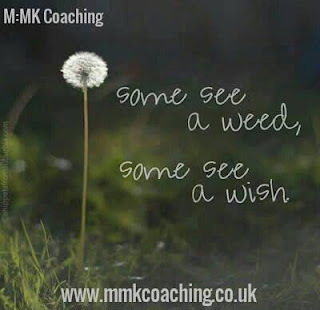 So today we start working together on a 8 week 'Weeds to Wishes' tailored Coaching programme, that I have designed around her individual requirements. So much so, iv even named it after her initial request. So I dedicate this post to her (you know who you are) & all the page followers, that like her are inspired by my posts from a distance. When your ready to start seeing your life's weed garden from a different perspective. It would be lovely to hear from you. Even if initially it's just for a complimentary & friendly chat.